Caught Annie Baker's subtle play about modern manhood, The Aliens, in a beautifully crafted production at SF Playhouse over the weekend. Forgive the concision of this blog post, but I'm dog-tired and want to get at least some brief thoughts down about the experience before hitting the sack. So I'll use bullet points to explain what I liked about it. 1. 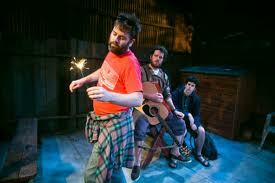 The play takes place in the garbage can-stinky, cramped and tightly-enclosed back yard of a cafe in Vermont. Bill English's incredibly detailed and realistic set design is full of symbolic portent -- it's like an ugly, inescapable concrete-laced womb which is the perfect environment for a play about a bunch of male characters who are still attached to their mothers by the umbilical cord. In essence, these characters are aliens living in an alien world. And they are completely alienated from their surroundings. 2. The power dynamics between the characters, who are played with great precision and passion by the three-strong male cast, are completely arresting. I spent a lot of time worrying about the negative ideas and habits that the young and impressionable teenager, Evan (a wide-eyed, deeply uncomfortable yet utterly adorable Brian Miskell) would pick up from the his new thirty-something waster acquaintances, KJ (a suitably out-of-it Haynes Thigpen) and Jasper (a spiky yet sensitive Peter O'Connor.) Director Lila Neugebauer keeps the tension oscillating between the characters. We think something disreputable or simply bad is going to happen to Evan. But then unexpected things happen and a tiny light shines at the end through the essential bleakness of the proceedings. 3. I got a fascinating insight into the young(ish) male psyche from watching this play. It's the bipolar opposite in some ways to the kind of maleness that David Mamet puts across in his play. Mamet's characters are all swagger on the outside but soft on the inside. Baker's are the reverse. Both versions ring true, but Baker's seems more radical somehow.